LOS ANGELES, Nov. 24, 2015 /PRNewswire/ -- Multi-platinum-selling recording artist and entertainer, Josh Groban, announced today a Summer 2016 tour in support of his massively successful album Stages. JOSH GROBAN: ON STAGE, produced by Live Nation, kicks off on July 15, 2016 in New Orleans, LA and will hit more than 20 cities around the country including dates in Los Angeles, Chicago, Atlanta, Detroit and more. Sarah McLachlan will join Josh Groban as a special guest on select dates during the tour. Citi® cardmembers will have access to pre-sale tickets beginning Monday, Dec. 7 at 10:00 a.m. local time through Citi's Private Pass® Program. For complete pre-sale details, visit www.citiprivatepass.com. Tickets go on sale for the general public on Dec. 11 at www.livenation.com. Josh Groban returns to PBS in an all-new television special based on his latest album, Stages, which explores one of Josh's earliest musical loves — Broadway and Broadway musicals. Recorded before a live audience at the historic Los Angeles Theater in downtown L.A., JOSH GROBAN: STAGES LIVE brings some of the most iconic songs in the Broadway musical songbook to life. JOSH GROBAN: STAGES LIVE is part of special programming premiering on PBS stations beginning November 28, 2015 (check local listings). 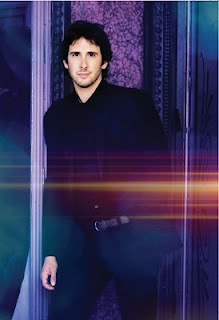 Groban will make several television appearances in the coming weeks including Live! with Kelly and Michael on Nov. 24, The Talk on Dec.11 and The Late Late Show with James Corden on Dec. 14 and Good Morning America later in December. Stages is a collection of some of the greatest musical theater songs of all time, which Groban describes as "gorgeously arranged songs that have stood the test of time," and which he was drawn to because of their combination of "incredible melody with an incredible story." The album is out now and has already been certified Gold by the RIAA. Recorded with producers Humberto Gatica and Bernie Herms in both Los Angeles and London's Abbey Road (with a 75-piece orchestra), Stages features songs from Les Misérables ("Bring Him Home"); Rodgers and Hammerstein's Carousel ("You'll Never Walk Alone"); Stephen Sondheim's Sunday in the Park with George ("Finishing the Hat"), Sweeney Todd ("Not While I'm Around") and Into the Woods ("Children Will Listen"); The Fantasticks ("Try to Remember"); A Chorus Line ("What I Did For Love"); Andrew Lloyd Webber's Phantom of the Opera ("All I Ask of You"), The Wizard of Oz ("Over the Rainbow"), and others. Another highlight is "Pure Imagination," originally sung by Gene Wilder in the film Willy Wonka & the Chocolate Factory. Watch the album trailer for Stages here. Sarah McLachlan is one of the most celebrated singer songwriters in entertainment with over 40 million albums sold worldwide. She is an eight-time Juno Award winner and a three-time Grammy Award winner. McLachlan's landmark fifth album, the 10x-platinum Surfacing, contained two Grammy Award-winning tracks, "Building a Mystery" and "Last Dance." Her most recent album, Shine On, explores her personal journey over the last three years navigating love, loss and change. Shine On celebrates the human ability to grow from our experiences, thrive and shine on.